(CNN) - Watching the presidential election play out, it's easy to see that campaigning is a crumby business. So it's nice when, in the middle of the campaign ad clutter, the debates over who built what, the bus tours, the rallies, the polls with that margin of error - to hear a business owner in the gritty, tough, highly coveted battleground state of Ohio ask, "Do you want a cookie?" Walk into Busken Bakery in Cincinnati and you will find customers huddled around the freshly-baked faces of Democratic incumbent President Barak Obama and Republican presidential nominee Mitt Romney, each in the form of a tasty, round cookie. 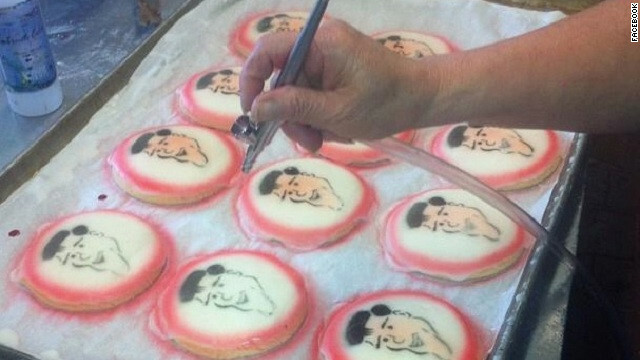 The famous Busken Bakery presidential cookie poll kicked off last week, when the bakery started selling the cookies decorated with the likenesses of Obama and Romney. And every day until the end of the election, Busken will keep tabs on how many people buy Barack and how many buy Mitt. Owner Dan Busken claims the cookie poll almost always picks the winner. And don't think the results are half-baked. "This is our eighth election cycle with the cookie poll, and we usually match the electoral vote count within 2%," said Busken. With sales already at a brisk pace, by the close of business Thursday Busken had sold 1,848 Obama cookies and 1,489 Romney cookies, he said. The numbers are updated every 24 hours. The cookie poll is credited to Busken's father, who began by running highly successful Super Bowl cookie polls at the bakery. Pick the team, pick the cookie, and pick the winner. "That went on for about 13 Super Bowls. We got it right 11 times," Busken said. When the NFL tightened up its licensing restrictions, his dad changed games, turning to the political arena in 1984. And the cookie poll is still getting it right. In the 2008 Busken cookie poll, the results were 12,000 Barack Obama cookies to 6,000 John McCain cookies, Busken said. "That was the first time a Democrat led from the beginning," he said, adding the result was all the more notable because of the area's strong Republican base. But even the cookie poll can sometimes crumble. "1992," Busken recalled. "That was the race between Bill Clinton, President George H.W. Bush and Ross Perot." The cookie poll was off – it didn't pick Clinton. Busken suspects the presence of third party candidate Perot soured the dough. Unlike the candidates, the presidential cookies at Busken's bakery taste the same. "The cookie is a hybrid shortbread/sugar cookie, it's our signature cookie," Busken explained. "It has white icing with a red circle on the Romney cookie and a blue circle on the Obama cookie." There's no difference in price, either. On the company's website, Busken.com, customers are charged $40 for a dozen cookies, regardless of the candidate. It's easy to stuff the ballot box in this contest, since Busken is not enforcing a "one person, one cookie" rule. Customers are encouraged to "vote" often, even daily if they wish, with no regard to the number of dinners that may be spoiled. 'It's a weird, quirky way to have fun with the election," Busken said of the cookie poll. "We started the campaign earlier this year than in 2008. We'd like to sell more this year." 1. Not paying taxes even equal to the middle class pays and still wants more Tax cuts for himself – and cries that 47% don't pay taxes. How can we trust him – when he cannot share his tax returns – This means there is something to hide. He want to call 47% as suckers – But I think he is a even bigger sucker by keeping money in Swiss account and also in Cyaman islands. 3. Poor and Middle class people are paying there dues taxes in terms of sales tax, property taxes and so on. Actually, the people who spend all there money are actually paying much higher taxes then Rich who are not spending but keeping money in the banks!! Do you know why? – very simple every good they buy has hidden tax as part of the cost of the good. Listen to Republicans talk about healthcare – By business having to provide healthcare – cost of goods will increase (Healthcare is nothing but tax – as already said by Supreme court). So the taxes business pay or the employees pay directly or indirectly part of the cost of the goods. If he doesn't understand that then there is a bigger problem. Do they have a cookie that reads I can't do it from the inside in Washington so you'll have to do it from the outside, in other words, I am in over my head in this job of president so let me pass the buck to someone else to do it but I still want to keep the chair of president, you guys do my job from the outside?????????? Let me know when you guys have succeeded with Congress and then I'll take the credit for it????????? Seriously, what a joke. How do you match the electoral vote within 2%? By electoral vote you have to sell cookies in all 50 states "plus" Don't you mean the popular vote? If that's the case then you were off by about 14% in 2008. Hope it's not a bitter bite. "I'm not sure about these cookies. They don't look like you made them," Romney said to the woman sitting next to him. "No, no. They came from the local 7-eleven, bakery, or whatever." If Mitt Romney saw them he would ask if they came from a local store, implying they tasted awful. He's been known to do that. As the chart shows, since January 2009, when President Barack Obama took office, the net change jobs has been negative (-1.3 million), while 5.7 million workers and dependents have been awarded disability and a whopping 15.1 million have been added to the food stamp rolls. "A total of 46,670,373 Americans are now on food stamps," according to the minority side of the Senate Budget Committee. "The food stamp program has doubled in size since 2008 and quadrupled since 2001." Better not ask Mitt Romney if he would like a cookie cause he will no doubt insult the bakery and claim their cookies were not fresh baked and came from the local 7/11, he is such an elitist!